What are these black and white insects hovering over our sandboxes in the summer? They are called sand wasps. They are most noticeable during July and August. Measuring less than two centimetres, they are black and yellow or black and white. 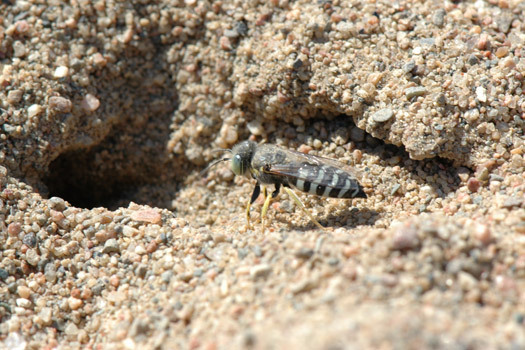 As solitary insects, they do not build nests but lay their eggs directly in the sand. Unlike social wasps, which build nests, live in colonies and can be very aggressive, sand wasps are not aggressive at all and tend to avoid us when disturbed. Instead of being afraid of the insect, it is important to understand that it is our ally because sand wasps help us get rid of harmful insects and play an important role in pollinating our flowers. In fact, it feeds its young on flies, bugs and ants. One sand wasp can chase away up to 15,000 insects alone! Adult sand wasps feed on nectar which helps with flower pollination.